We just love it when new ideas pop into our head. It has been awhile since the 'five ingredient recipe' theme has been the main topic here. Let's fix that today! Pasta is a staple ingredient in our kitchen. We love all the different shapes and sizes of pasta, including dried, refrigerated, fresh, and frozen. Pasta is very easy to cook, kids and adults like it, and it can be transformed into brand new recipes using just a few ingredients. The trick to inventing five ingredient recipes is to look for grocery items that combine several ingredients into one package. For instance, the frozen chopped bell pepper and onion stir-fry combination are one of our favorite shortcut ingredients. Dried herb mixes, salsas and sauces, dry pasta and bean mixes, salads and prepared food from the deli, and seasoned canned vegetables are all essentials in the five ingredient pantry. Also, be sure to use the freshest and best quality ingredients that you can find in these recipes. Each ingredient's flavor and color stand out in these simple recipes so they need to be the best. Enjoy these five-ingredient pasta main dishes and salads; and remember, substituting your own favorite ingredients for those called for in a recipe is what makes cooking a creative challenge! Cream cheese makes pasta sauce so smooth and velvety and adds a wonderful tang. This is a go-to recipe for me in the winter. This simple recipe has such a wonderful flavor. If we were to add another ingredient, it would be minced garlic. Bottled Alfredo sauce is the secret ingredient in this fabulous recipe. If you can't find a cheese sauce, add some shredded Colby or Muenster cheese. Tender chicken thighs are mixed with cheese and Italian seasonings, stuffed into pasta shells and baked in tomato sauce in this wonderful casserole. 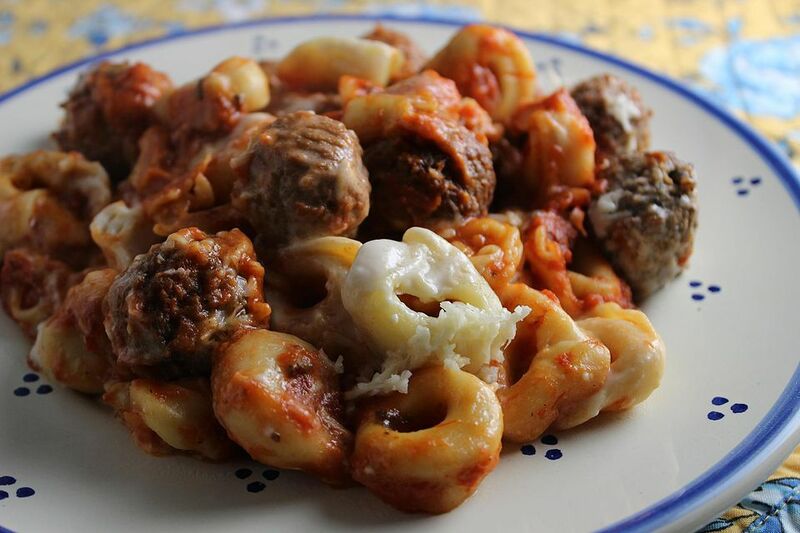 We always have frozen tortellini in our house, to make super quick recipes just like this one. Lasagna can be a complicated recipe, but not this gem! Just five ingredients make a hearty and delicious main dish. Canned chicken is used in this super fast recipe, but you could use leftover chicken, shredded and stirred into the creamy cheesy sauce. The day we discovered that pasta could be cooked in the crockpot is the day our life became much easier. We love this simple recipe. This wonderful meal is made of five ingredients. It's hard to believe such a short ingredient list can make a fabulous dinner, but it's true. Canned chicken is really good, and is perfect to use in any recipe that calls for pre-cooked chicken. Leftover chicken can be used in this great recipe too. We make this incredible recipe often in the cold months. It takes about three minutes of work for a wonderfully warming meal. Although the ingredient list for this recipe looks long, it's mostly seasonings. We love this comfort food recipe. This recipe was the first we tried that used frozen pasta and just baked it in a sauce. It turns out perfectly every time. Make this recipe in the summer when basil and tomatoes are both at their peak. It's so good. If you love clams, this is the recipe for you. I'd add some chopped tomatoes with the clams. This salad reminds me of some we've had at restaurant salad bars. It's simply satisfying. Pasta and legumes is a really delicious combination. Any chopped fresh herb is delicious in this super simple recipe. We think it tastes great next to a grilled steak, with a simple fruit salad. Garlic, parsley, and cheese are delicious with spaghetti. You could use angel hair pasta, fettuccine or linguine in this easy recipe.